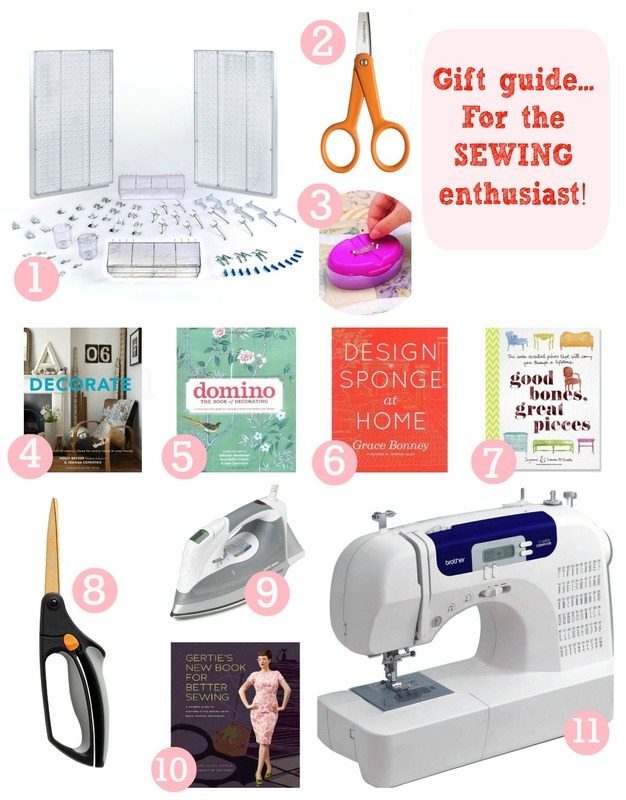 Gift guide: for the sewing enthusiast! People often ask me about what gifts to get for a friend or relative who loves to sew... I wonder if there's a universal answer! I usually suggest a few ideas, and of course it depends what kind of sewing the recipient does, and what she/he has already. I guess sewists are as diverse as anyone, almost--although there are some things a lot of us have in common. Super sharp, pointy thread snips! Powerful and wonderful magnetic pin cushion/pin caddy--not super common so she probably doesn't have one already, but sooo helpful! This is my iron, and I love it! For the new sewer or crafter who wants to get into sewing, a big gift would be a simple machine like this one. My friend has it and I've used hers once, and I approve! There you have it. Holiday gifts of all kinds for the stylish, creative, ambitious or new sewing fan in your life! Or, sewers out there, what do you like to get as gifts that support your hobby?? I'd personally prefer assorted notions over books. I can't get enough high quality zippers, lace and other assorted trims, thread, buttons, and appliques. Also, I'd add extra blades for my rotary cutter and fat quarters to my list. I have an entire bookshelf of sewing books and my go-to book I recommend is this book: http://www.amazon.com/Dressmakers-Handbook-Couture-Sewing-Techniques/dp/1596682477. True, notions are super useful and a pain to keep buying. Wonder if anyone would know you well enough to know what you needed, though! I am terrible about getting my sewing machine serviced regularly so I recommend a gift certificate to your local sewing machine service and repair shop. It should be done annually, but most of us let it go for several years, or until it starts acting up. Fabulous ideas! I, too, am too lazy and cheap to get my machine serviced once a year. =( I really should!!! Needles would be a great stocking stuffer! I second the gift cards to fabric shops!! I also want to get a pegboard/organization system, but maybe they have something cheaper at Lowes or Home Depot? I've never seen anything similar anywhere else, I think that brand sort of has a monopoly... I bought one for myself and love it. I think it was totally worth the $45 or whatever! spring loaded scissors save your hands a bunch. I am always up for a good iron, exactly which one is that one, and is it light? that is one of my pet peeves. Definitely. The iron is a top-rated Black and Decker model, and it's probably in the middle of the light-heavy range. My old $10 crappy one was lighter, but awful. My mom's intense professional one is heavier, though. My arms never get tired or anything with this one! These are some great ideas! I might have to check out that Sewing Handbook for myself . I am a wannabe sewing enthusiast, aka I have a sewing machine and do not even know how to use it! I actually asked for lessons for Christmas! That would be a great gift!! I asked for a bag/kit to travel with my sewing machine. I usually lug it around in a box with my supplies stashed in a bag. My girlfriends and I host sewing parties every few months and having a bag intended for lugging my machine around would be glorious. This is a little late, but I got some fabric for Christmas, along with a gift card to the fabric store to buy more! My mother-in-law stalked my pinterest (and even just asked me what I thought of certain patterns) and then surprised me with a few yards of chevron for making pillows or whatever for our new house!